Follow My Dream: They Love it! Of course, right? If you've ever been to Kauai you know. They were troopers last night, up for almost 24 hours at age 80 and still managed to keep their spirits up. Mom, dad and I got emotional at the airport but the tears turned into smiles as we headed into the beautiful Kauai day. Dan and I remembered our first time here, stunned by the enomous beauty, so we drove. They had worn warm clothes for the plane ride over and needed something a lot lighter to wear. We took them straight to Hilo Hattie's for some aloha shirts before heading up to Princeville to meet up with Tom. We took them home after dinner at the Hanalei Dolphin. We only recommend going for lunch, sushi and to get fresh fish from their market - dinner is way too expensive for what you get, mom had a small mahimahi filet and fries for $30. Puamana and I drove up to Princeville so she could give them a massage. Mom and dad were sitting on the front porch going over all the "what to do in Kauai" magazines I grabbed for them at the airport. They spent their morning on the lanai gazing at the towering mountains, ocean, birds and laughing at the chickens. Puamana went right up to them and gave them a kiss on each cheek and a big, warm hug. Local style only she does it the best, with genuine affection. They fell in love with her right away, as I did when I first met her. 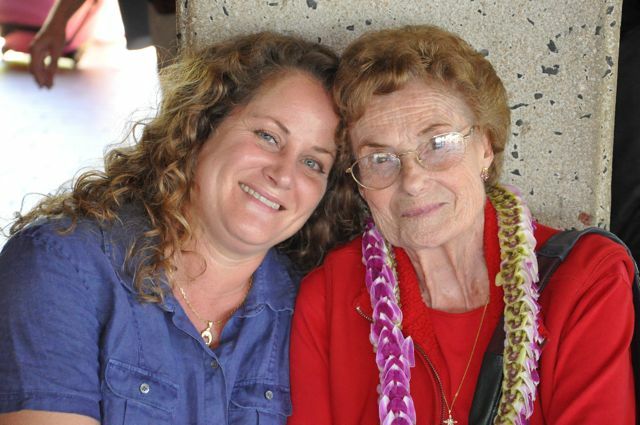 She is saturated in genuine aloha spirit and generous with her time and beautiful easy smile. The tension of travel was erased and mom said Puamana made her feel 20 years younger! Back in Kapaa, Puamana made us lunch local style; teriaki beef, Korean chicken, steamed rice, mac salad and a tomato salad. Dan whipped up some fresh coconut water and rum drinks and we sat outside under the lychee tree to eat. Shopping in town they bought T-shirts, flip-flops, dresses, post cards, taro chips, Red Dirt shirt, hat and groceries before we took them back home to Princeville. We had to rush home because I needed to get my article for next weeks MidWeek Kauai in.